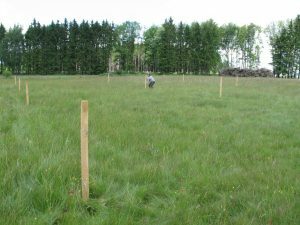 Experimental area 4 as a nutrien-poor grassland site can be categorised between “Species-rich Nardus grasslands” (NATURA-Code 6230) and “Mountain hay meadow” (NATURA-Code 6520). It is located in the subdistrict Eichelhain. On this site only one cut per year is possible. The vegetation mainly consists of Festuca rubra, Poa chaixii, Nardus stricta and Agrostis capillaris as well as Lathyrus linifolius and Luzula campestris.